For generations, people living in cold climates have been canning to preserve food for the winter. Nowadays, the cold pack method of canning is a popular way to preserve fruits and vegetables at home to enjoy them fresh throughout the year. Canning saves money, too. 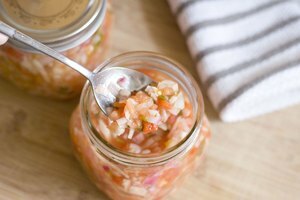 Pickles, peppers, relish and salsa are just a few recipes that use cold pack canning. The cold pack method uses a water bath canner instead of a pressure canner. Purchase pint- or quart-sized canning jars with new lids and rings. Ball, Kerr and Mason are the most popular canning jars. If you're reusing jars, purchase new lids and rings every time. Do not use mayonnaise jars or pickle jars; they are not safe for processing. Purchase a jar puller, jar funnel, ladles and colanders. A jar puller looks like a wide pair of tongs. The wide end fits snugly over a hot jar to lift it out of the boiling water. A jar funnel fits perfectly inside a jar to easily pour in ingredients. Purchase a water bath canner. Once the jars are filled, they'll go into the canner for processing. Typically, jars are processed for 10 to 20 minutes in boiling water to preserve their contents. Water bath canners are available in 7- or 12-pint-jar capacity. They have a removable wire rack on the inside that lets you lower and raise the jars in and out of the water without being burned. 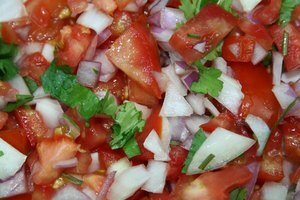 Choose recipes like salsa, spaghetti sauce, chow chow or other canning recipes that only require water bath preserving. Pickles, pickled peppers and other pickled products are also processed with a water bath or cold pack method. Follow the recipe exactly. Canning recipes have been tested and are accurate to accomplish a sealed product that's safely preserved. Clean and sterilize the jars and lids in the dishwasher on a regular cycle. 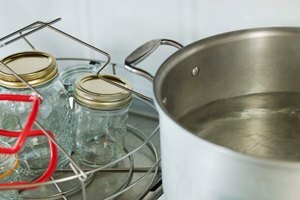 If you don't have a dishwasher, place the jars and lids in a large pot with enough water to cover them, and boil them for 10 minutes on the stove. Remove and place them on a towel on the countertop to dry. Fill the water bath canner halfway with water, without the rack, and set it on the stove on medium-high heat. Keep the water hot but not boiling. Follow your recipe for filling the sterilized jars. Once the jars are filled, put on the lids and rings. Set the wire rack onto the sides of the water bath canner, positioned above the water. Place the sealed jars into the wire rack and lower them into the water. Place the lid on the canner and heat to boiling. Once again, follow the recipe for processing times; they're different, depending on what you're canning. When processing is complete, remove the jars from the water bath canner and place on a towel on the countertop to cool. Once the jars are cool, perform a fingertip test by pressing on the center of the lid. If the lid does not spring back, the jars are sealed and can be stored in the pantry for 6 to 12 months. If the lid does spring back, that particular jar is not sealed and must be placed in the refrigerator; it should be eaten first, within three weeks.